31 Dec 2015 Put up a performance stills page for the Hüsker Dü 25 Oct 1985 gig at the New York Theatre in Vancouver BC. Thanks to Aron Shute and Dan Walters. 26 Dec 2015 Put up a venue image page for the Triple Rock Social Club in Minneapolis (where Grant Hart played on 26 Dec 2013). 25 Dec 2015 Put up a performance stills page for Grant Hart's 19 Dec 2015 instore gig at Revival Records in Eau Claire WI. Screencap from video posted to Facebook by Peter Rudrud. 24 Dec 2015 Previously unlisted Hüsker Dü date discovered via a flyer image posted to Facebook by Drew Hirsh: 5 Aug 1983, Goofy's Upper Deck, Minneapolis. Added the flyer image and updated the 1983 poster index page. Minor venue correction made for the first date, which had been listed as Great Hall: Tripp Commons is a different space in the same building. The second date had not previously been listed at all and was added to the performance dates page. Thanks to Robin Davies. 16 Dec 2015 Added a long overdue entry for the video recording of the 16 Dec 1983 Hüsker Dü show (Love Hall, Philadelphia) to the live video section of the annotated discography and embedded the YouTube video. Also put up a proper setlist page, since the dates page had previously pointed to a list of songs on the audio recording, which was incomplete. 11 Dec 2015 Put up venue image pages for Goofy's Upper Deck in Minneapolis and Revival Records in Eau Claire WI. 11 Dec 2015 Added a just-announced Grant Hart date: 19 Dec 2015 at Revival Records, Eau Claire WI (free instore performance). Thanks to Chris Jackson for the info. 08 Dec 2015 Put up a poster image for the Dec 2015 Dinosaur jr shows at Bowery Ballroom in NYC (Bob Mould was one of the "special guests" on 06 Dec 2015), and updated the 2015 poster index page. 07 Dec 2015 Put up a setlist page and a performance stills page for Bob Mould's guest appearance last night with Dinosaur jr. at Bowery Ballroom in NYC. Also added "Cortez The Killer" and "Freak Scene" to the titles list and the cover songs page. 04 Dec 2015 Added a previously overlooked entry to the annotated discography for last year's Bob Mould promo video for The War and updated the summary discography. 01 Dec 2015 Put up a calendar image showing the 14 Dec 1982 Hüsker Dü show at the Entry in Minneapolis and updated the 1982 poster index page. 01 Dec 2015 Put up a performance stills page for the 27 Nov 2015 Gang Font gig at Icehouse in Minneapolis. Thanks to Vanessa von Bitter and Jason Larkin. Also put up a poster image for the tour, and updated the 2016 poster index page. More info here. Thanks to Chantal Latchford for the pointer. 29 Nov 2015 Put up a setlist page for the 21 Dec 1985 acoustic instore performance at Garage D'Or Records in Minneapolis featuring Grant Hart, Bob Mould, and Dave Pirner. 29 Nov 2015 Added an entry to the annotated discography for the Bob Mould Beauty & RUIN advance CD. Also put up an artwork page for the CD and updated the summary discography. 29 Nov 2015 Added an entry to the annotated discography for the Greatest Ever! Pop Punk VA compilation (featuring one Hüsker track) and updated the summary discography. No artwork page yet. 28 Nov 2015 Added an entry to the annotated discography for the After Midnight VA compilation, given away with the Aug 2014 issue of Uncut magazine (featuring a Bob Mould track). Also put up an artwork page for the CD and updated the summary discography. 27 Nov 2015 Put up venue image pages for The Globe in Cardiff and Liquid Room in Edinburgh. 26 Nov 2015 Put up a new poster image for the Feb 2016 Bob Mould Band UK tour, and created a 2016 poster index page. 24 Nov 2015 Added an entry to the annotated discography for the Hüsker Dü Minneapolis Moonstomp bootleg CD, put up an artwork page, updated the summary discography, and updated the Spin Radio Concert Bootleg Comparison Charts page. 24 Nov 2015 Put up a venue image page for the Tivoli in Utrecht (original location, which closed in 2014). 23 Nov 2015 Put up a performance stills page for the Grant Hart/Chuck Dukowski 21 Nov 2015 gig at Cafe NELA in Los Angeles (Dez Cadena benefit show). Thanks to Dennis Pelowski. Sugar, Besides 2x12" release on Edsel/Demon (Nov 2013). Bob Mould, Black Sheets Of Rain CD reissue on Edsel/Demon (May 2015). Bob Mould, Black Sheets Of Rain 12" reissue on Demon (Jul 2015). No artwork for these yet. 22 Nov 2015 Added an artwork page for the Hüsker Dü Zen Arcade: Complete Outtakes bootleg CD. 21 Nov 2015 Added an entry to the annotated discography for the Hüsker Dü Zen Arcade: Complete Outtakes bootleg CD and updated the summary discography. 20 Nov 2015 Added a still more info to the venue description page for Charlie's Obsession in LA, from reminiscences forwarded by Andy Nystrom, who attended the Hüsker show there in Nov 1985. 18 Nov 2015 Added a bit more info to the venue description page for Charlie's Obsession in LA, as provided by a correspondent named Mark (no surname given). Many thanks to Terry Katzman for providing the list. 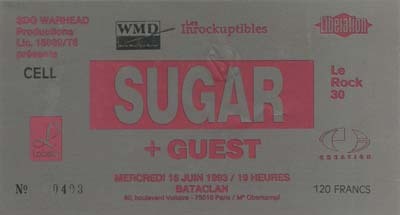 13 Nov 2015 Put up a performance stills page for the Sugar 16 Jun 1993 gig at Bataclan in Paris. 09 Nov 2015 Put up a setlist page for Bob Mould's guest appearance last night with Foo Fighters at Mercedes-Benz Arena in Berlin. Also put up a venue image page for the arena. Also added "Detroit Rock City" to the titles list and the cover songs page. 09 Nov 2015 Added a recently announced Grant Hart date: 21 Nov 2015, Cafe NELA, Los Angeles (Dez Cadena benefit). Ticket info here. 06 Nov 2015 Added more info to the entry in the annotated discography for the 12" vinyl reissue of Grant Hart's Ecce Homo album. 06 Nov 2015 Added an entry to the annotated discography for the Bob Mould Live Mould bootleg CD, put up a placeholder artwork page for it, and updated the summary discography. 05 Nov 2015 Embedded video clips in the annotated discography entry for the video recording of Hüsker Dü at the Entry in 1980, earliest known footage of the band (converted from Super 8). 04 Nov 2015 Added an entry to the annotated discography for the 05 Jun 2014 Bob Mould Band live radio performance on the Morning Becomes Eclectic program on KCRW. 28 Oct 2015 Added an entry to the annotated discography for the recent 12" vinyl reissue of Grant Hart's Ecce Homo album, updated the summary discography, and put up a temporary artwork page for the vinyl. Thanks to Ted Theodore for the Sinclair photos. 23 Oct 2015 Put up a performance stills page for Bob Mould's guest appearance with "Ian Rubbish" (Fred Armisen), 03 May 2015, at Masonic in San Francisco. 16 Oct 2015 Put up a performance stills page for the 02 Nov 1984 Hüsker Dü show at 7th Street Entry in Minneapolis. Thanks to Greg Norton, whose mother shot the picture. 16 Oct 2015 Added an entry to the covers and tributes section of the annotated discography for the Kristofer Aström cover of Hardly Getting Over It (released today on a 7" single titled Mother), updated the cover songs cross-reference list, and put up a temporary artwork page for the single. 14 Oct 2015 Added a just-announced Gang Font (Greg Norton on bass) gig to the dates page: 27 Nov 2015 at the Icehouse in Minneapolis. 07 Oct 2015 Added an entry for the new Official Hüsker Dü merchandise site to the Hüsker links page. Thanks to Robert Arce. 07 Oct 2015 Put up a performance stills page for the 07 Oct 2005 Bob Mould Band show at the 9:30 Club in Washington DC. Screencapped images taken from the Circle Of Friends DVD. 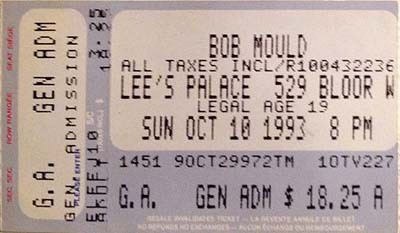 06 Oct 2015 Added a ticket image to the ticket collage page for the 23 Sep 2015 Bob Mould show at The Sinclair, Cambridge MA. 03 Oct 2015 Made some changes to the dates page entry for 03 Nov 1985: correspondent Jeffrey Casper attended the show at the Utah State Fairgrounds in Salt Lake City and confirms that the performance took place in the evening. This casts doubt on the other SLC gig (Palladium Dance Club) listed for that date. Added a link to the Utah State Fairgrounds Horticulture Building (now known as Promontory Hall), and put up a venue image page. 03 Oct 2015 Corrected the dates page link to Ralph's Diner in Worcester MA and put up a venue image page. 03 Oct 2015 Put up a setlist page for last night's Bob Mould Band "Works in Progress" tour show at Red Clay Music Foundry, Duluth GA. Thanks to Greg Phillips. Thanks to Bob Mould and Jason Narducy for help identifying the titles. Thanks to Sumant Ranji for the SF setlist. 21 Sep 2015 Added another overlooked Bob Mould date: 19 Sep 2015 at City Winery, Napa CA. Also added a venue image page for the Napa City Winery. 19 Sep 2015 Added the 1985 SST Flip Your Wig press kit (plus some extra material) to the Press Releases collection. 18 Sep 2015 Added a Bob Mould date that was somehow overlooked: 18 Sep 2015 at Swedish American Music Hall in SF. 18 Sep 2015 Added a newly discovered Bob Mould guest appearance to the dates page: 03 May 2015, with Ian Rubbish (Fred Armisen), Masonic Center, San Francisco. Bob played guitar on one song, "It's A Lovely Day." Put up a setlist page (including embedded video and a Masonic venue image page. Added the song to the titles list and the cover songs page. 01 Sep 2015 Updated the venue description page for Euphoria Tavern, Portland OR, to incorporate reminiscences submitted by correspondent "Savannah." 29 Aug 2015 Put up a new flyer image for the 17 May 1985 Hüsker Dü show at Jockey Club in Newport KY, added the link to the dates page, and updated the 1985 poster index page. Also put up an alternate flyer image for the same gig. 28 Aug 2015 Put up a performance stills page for the 20 Jun 1984 Hüsker Dü show at Chet's Last Call in Boston. Thanks to the photographer, Al Quint. 28 Aug 2015 Updated the venue description page for JB's Down Under, Kent OH, to add clarification provided by correspondent Deborah m.
27 Aug 2015 Put up a new flyer image for the 22 Apr 1987 Hüsker Dü show at Prisms in Chandler AZ, added the link to the dates page, and updated the 1987 poster index page. Thanks to M. a. Ross. 27 Aug 2015 Updated the Hüsker Dü links page, deleting a bunch of dead links and adding a link to the Compositions for the Young and Old series of Hüsker/Mould album reviews. 23 Aug 2015 Added a new Hüsker Dü photo to the candid photos page: spring 1985, Minneapolis. Thanks to the photographer, Dorit Cypis. 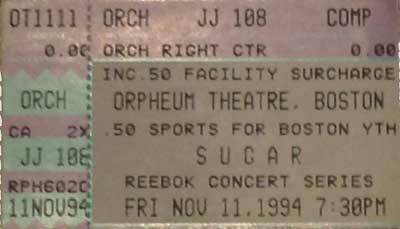 22 Aug 2015 Added a ticket image to the ticket collage page for the 11 Nov 1994 Sugar show at the Orpheum in Boston. Thanks to Stacey Baker. 22 Aug 2015 Added a bit more info to the description of the Makes No Sense At All/Love Is All Around promo video. 21 Aug 2015 Updated the venue description pages for Charlie's Obsession in LA and Odeon in Münster. Thanks respectively to Les Greenfield and James Lynch. 14 Aug 2015 Updated the venue description page for the Maceba Theater in Houston, incorporating comments provided by former bouncer Jamie Morris. 20 Jul 2015 New Grant Hart date announced: 31 Aug 2015, 7th St Entry, Minneapolis. Put up a flyer image and updated the 2015 poster index page. 09 Jul 2015 Added a print ad image for the 28 Nov 1981 Hüsker Dü show at Goofy's Upper Deck in Minneapolis and updated the 1981 poster index page. 22 Jun 2015 Put up a performance stills page for the 26 Oct 1984 Hüsker Dü show at Minneapolis College of Art and Design. Thanks to the photographer, Brian D. Garrity. 17 Jun 2015 Added an attribution line to the flyer image for the 17 Jun 1982 Hüsker Dü show at Northpark Lion's Club in San Diego after learning that it was created by Lee Ellingson. Also updated the 1982 poster index page. Thanks to Ron Clark for the info. 11 Jun 2015 Added an entry to the covers and tributes section of the annotated discography for the 2011 Cloudberry cover of Don't Want To Know If You Are Lonely, updated the cover songs cross-reference list, and put up an artwork page for The Closer We Get CD. 11 Jun 2015 Added an entry to the annotated discography entry for the Foo Fighters Wasting Light album, one track of which features Bob Mould on guitars and vocals. Also put up an artwork page for the CD and updated the summary discography. 09 Jun 2015 Added an entry to the annotated discography entry for the This Wheel's On Fire VA compilation, given away with the Aug 2013 issue of Uncut magazine (featuring a Grant Hart track). Also put up an artwork page for the CD and updated the summary discography. 08 Jun 2015 Added an entry to the annotated discography entry for the VA Merge Sampler, 2012-2013 promo CD, which includes one Bob Mould track and one Sugar track. Also put up an artwork page for the CD and updated the summary discography. 08 Jun 2015 Added an entry to the annotated discography entry for the Butch Walker Afraid Of Ghosts album, one track of which features Bob Mould on guitars and vocals. Also put up an artwork page for the CD and updated the summary discography. Also put up artwork pages for the Shanes and Brent Godfrey CDs. 07 Jun 2015 Added an entry to the annotated discography entry for the METZ VA compilation, given away at Rough Trade shops in 2012 with copies of the self-titled album by Canadian band METZ. Also put up an artwork page for the CD and updated the summary discography. 06 Jun 2015 Added a newly discovered Hüsker Dü performance date: 27 May 1982, The Drumstick, Lincoln NE. Put up a venue description page and a venue image page for The Drumstick. Thanks to Mike Blur and Jim Jones. 06 Jun 2015 Embedded a YouTube video clip in the entry in the annotated discography for the telecast of the 06 Jun 1987 Hüsker Dü Provinssirock gig, Seinäjoki, Finland. Also put up artwork pages for the Screamfeeder CD single, the Anodyne 2002 tour CD, the Hubcap Heaven Bob Mould (Hubcap album) tribute, the Something I Learned Today ZA tribute, the Pulco Wengen CD, and the Joel Plaskett Emergency Scrappy Happiness CD. 30 May 2015 Added an entry to the annotated discography for the just-released Do You Remember Radio? bootleg 2xCD, put up an artwork page for it, updated the summary discography, and updated the Spin Radio Concert Bootleg Comparison Charts page. 21 May 2015 Updated up the description in the annotated discography of the Japanese CD3 edition of Sugar's If I Can't Change Your Mind single, thanks to translation help from RJ Van Der Woud and Jez Quiney. 08 May 2015 Put up a print ad image for the 28 Apr 1984 Hüsker Dü show at Duff's in Minneapolis, and updated the 1984 poster index page. 24 Apr 2015 Beefed up the description in the annotated discography of Sonny Vincent Rec 1979-91, one track of which features Greg Norton playing bass during his stint with Shotgun Rationale in 1990. Updated the dates page and the affected poster index pages. 17 Apr 2015 Added newly discovered canceled Hüsker Dü date: 31 Oct 1985, Pomona Valley College, Pomona CA (replaced by gig at Fender's in Long Beach). 09 Apr 2015 Added more info to the annotated discography entry for The Complete Spin Radio Concert bootleg (track list found, and apparently there will be a CD version as well as vinyl). Updated the summary discography and the Spin Radio Concert Bootleg Comparison Charts page. 08 Apr 2015 Added an entry to the annotated discography for the soon to be released bootleg 12", The Complete Spin Radio Concert, put up a temporary artwork page for it, updated the summary discography, and updated the Spin Radio Concert Bootleg Comparison Charts page. Thanks to Brian Mastrobuono for the pointer. Also put up a poster image for the tour and updated the 2015 poster index page. 05 Apr 2015 Put up a flyer image for the 25 Dec 1982 Hüsker Dü show at Milo's Backyard, San Antonio TX, and updated the 1982 poster index page. 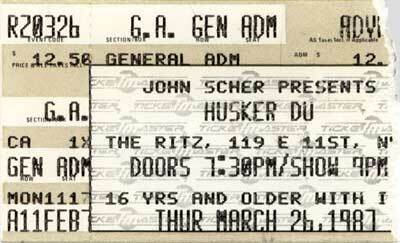 05 Apr 2015 Added a previously unknown Hüsker Dü show to the dates page: 13 Oct 1982, So's Your Mother, Des Moines IA. Info based on this newly discovered flyer. Also put up a venue description page and a venue image page for So's Your Mother, and updated the 1982 poster index page. Thanks to Mike Blur for the pointer to the flyer. 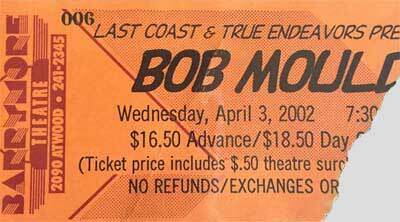 03 Apr 2002, Bob Mould, Barrymore Theatre, Madison WI, 03 Apr 2002 (courtesy of Jim Thompson). 26 Mar 2015 Redirected the dead Princess Charlotte (Leicester UK) link on the dates page to the now-closed club's Wikipedia entry and added a venue image page. 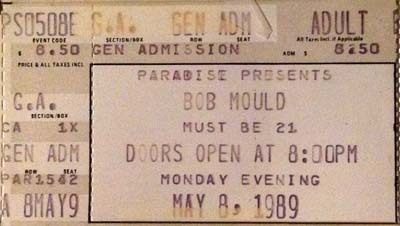 19 Mar 2015 Updated the description in the annotated discography for the live recording of the 15 May 1989 Bob Mould Band show at the Whisky in LA, based on info accompanying a recent low-generation upload to Dime. Thanks to Sumant Ranji for the pointer. 21 Mar 2015, Cake Shop, NYC. 01 May 2015, The Sydney, Omaha. 08 May 2015, Red Line Tap, Chicago (more info). Thanks to Steve Loftus and Travis Vande Berg. 08 Mar 2015 Confirmed that the date of the first Hüsker Dü show at the Channel in Boston was 18 Dec 1983, as had been previously surmised. The date appears on the Channel site's list of 1983 shows. 02 Mar 2015 Embedded a YouTube video clip in the entry in the annotated discography for the SST video The Tour. 02 Mar 2015 Embedded a YouTube video clip in the entry in the annotated discography for the MusiCalifornia program featuring Hüsker Dü. Also updated the description of the program. 27 Oct 1985, Pine Street Theatre, Portland OR. Reno basement gig discovered via an online archived copy of Paranoia #5 fanzine. Reno venue identified as Skate Plus from clues provided by Dale T. Nelson via Chris Hesler, as outlined in the new venue description page. Portland venue determined from this newly discovered flyer, which was added to the 1985 poster index page. 22 Feb 2015 Put up a poster image for the 15 Nov 2014 Bob Mould Band show at Òran Mór, Glasgow, Scotland, and updated the 2014 poster index page. Updated the 1992 poster index page. 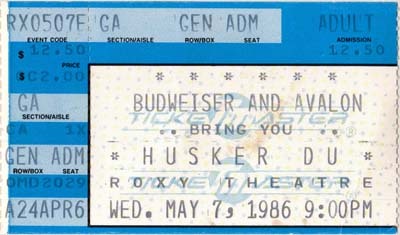 07 May 1986, Hüsker Dü, Roxy Theatre, Los Angeles. 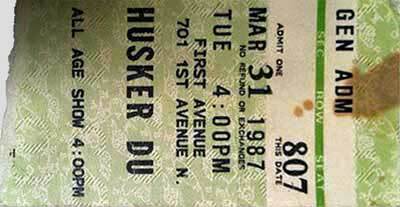 26 Mar 1987, Hüsker Dü, Ritz, NYC. 18 Feb 2015 Put up a setlist page for the 18 Feb 1997 Bob Mould show at the Barrymore Theatre in Madison WI (replacing a dead external link). Thanks to Eric-Schumacher-Rasmussen and Mark Weygandt. 14 Feb 2015 Added an entry to the annotated discography for the newly surfaced video recording of the Hüsker Dü 25 Mar 1984 show at City Gardens in Trenton NJ. A poor copy of this recording, high-generation and incomplete, circulated briefly in the early 90s before it was withdrawn. This superior version materialized as a YouTube upload in Jan 2015. Thanks to Bill Holtzheimer for the pointer. 11 Feb 2015 Added a newly announced Grant Hart date: 10 Apr 2015, Patrick's Cabaret, Minneapolis (Rain Taxi: Literary Tribute to Grant Hart and Hüsker Dü). 08 Feb 2015 Embedded a YouTube video clip in the entry in the annotated discography for the 1988 MTV News X-Ray feature on Hüsker Dü. 01 Feb 2015 Put up a setlist page for last night's Bob Mould Band show at 1st Ave in Minneapolis. Added "Complicated Fun" (Suicide Commandos song covered with guest Chris Osgood during the first encore) to the cover songs page and the song titles page. Put up a poster image for the two 1st Ave shows and created a 2015 poster index page. Thanks to Jason Narducy for the setlist and info. 31 Jan 2015 Put up a setlist page for last night's Bob Mould Band show at 1st Ave in Minneapolis. Thanks to Jason Narducy. 28 Jan 2015 Put up a venue image page for the former Barbue in Copenhagen and updated its venue description page. 15 Jan 2015 Put up a setlist page for the 15 Aug 1981 Hüsker Dü show at 7th St Entry in Minneapolis. The first set, which was recorded and released as Land Speed Record, has long been established. The info about second set, to which Bob alludes just before the final fade-out on LSR, was recently provided by Terry Katzman. 13 Jan 2015 Put up a performance stills page for the 28 Nov 2014 Gang Font show at Icehouse in Minneapolis. 13 Jan 2015 Put up a venue image page for the former Mendiola's Ballroom in Huntington Park CA. Also updated the 1981 poster index page. 13 Jan 2015 Added an entry to the bootleg audio section of the annotated discography for the newly released DOPE + SPEED = RECORD bootleg LP, put up a temporary artwork page for it, and updated the summary discography. Thanks to Brian Mastrobuono for the pointer. 09 Jan 2015 Put up a venue image page for the Concordia Ballroom in LaCrosse WI and updated its venue description page. 03 Jan 2015 Added an entry to the Promo Videos section of the annotated discography for Bob Mould video, I Don't Know You Anymore and and updated the Summary Discography. 01 Jan 2015 Put up a setlist page for last night's Bob Mould Band show at Metro in Chicago. Also added "He's A Whore" (Cheap Trick song covered during the encore) to the cover songs page and the song titles page. Thanks to Jason Narducy.